More than 20,000 music fans will descend on Thurles this weekend for the ultimate comeback when Feile Classical kicks off on Friday 21st and Saturday 22nd September. Billed as 'Feile for grown ups', the two day concert will reunite much of the original Feile line up from 90-94' in Semple Stadium with a classical twist in the form of the Irish Chamber Orchestra. What time does everything kick off? Gates at Semple Stadium officially open at 4pm on Friday with the earlier time of 3pm on Saturday. 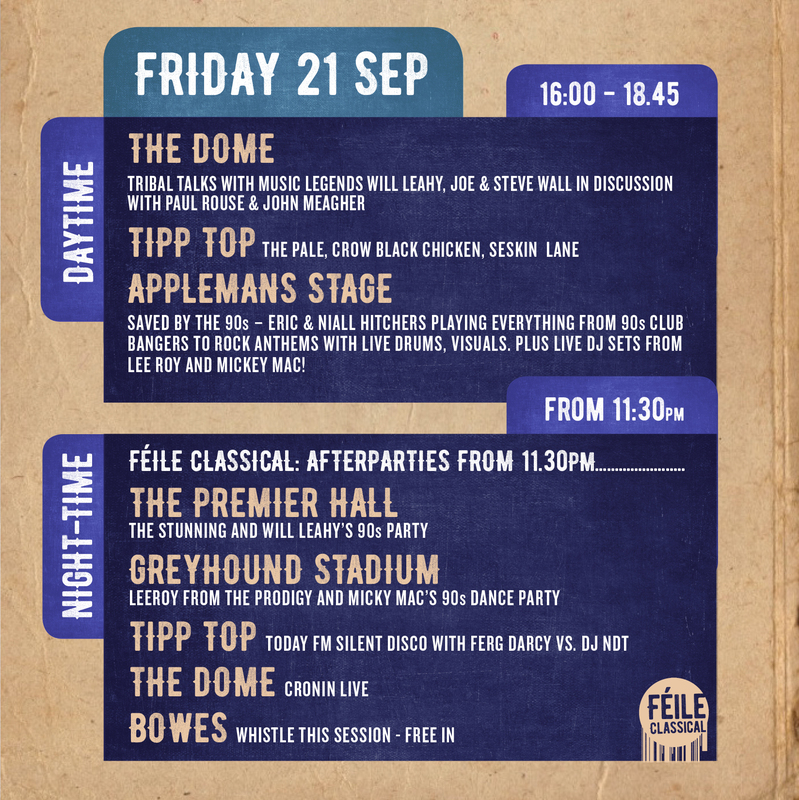 An exciting line up of events, including discussions and live music, take place on stages inside Semple grounds before the main stage opens at 7pm bringing the original Feile headliners back on the pitch once more. 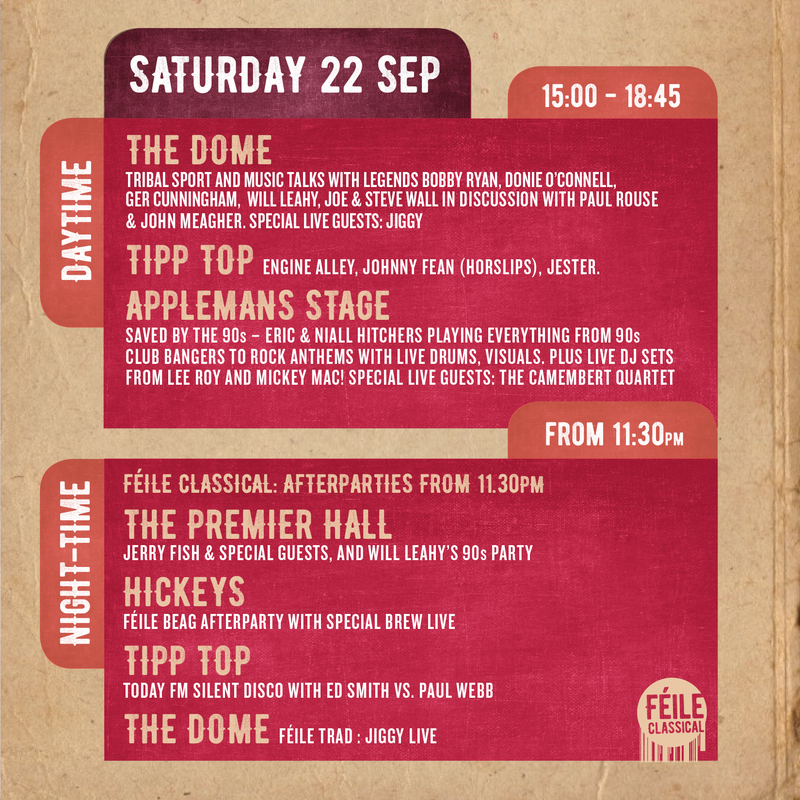 The Dome: Tribal talks with music legends Will Leahy, Joe and Steve Wall in discussion with Paul Rouse and John Meagher. The Dome: Tribal sport and music talks with legends Bobby Ryan, Donie O'Connell, Ger Cunningham. Will Leahy and Steve Wall in discussion with Paul Rouse and John Meagher and special guests Jiggy. Appleman's Stage: Saved by the 90's - Eric and Niall Hitcher's playing everything from 90's to rock, a live DJ set from Lee Roy and Mickey Mac plus special guests the Camembert Quartet. On Saturday 22nd a host of free events have been organised for the Thurles 'Music Trail' with 12 free pop up music performances taking place in selected venues across the town including sets from Locklin, Bright Falls, Sam Rappoport & 5 Day and Hvmmingbyrd. A number of events and after parties will run in venues across Thurles following Feile Classical from 11.30pm each night. 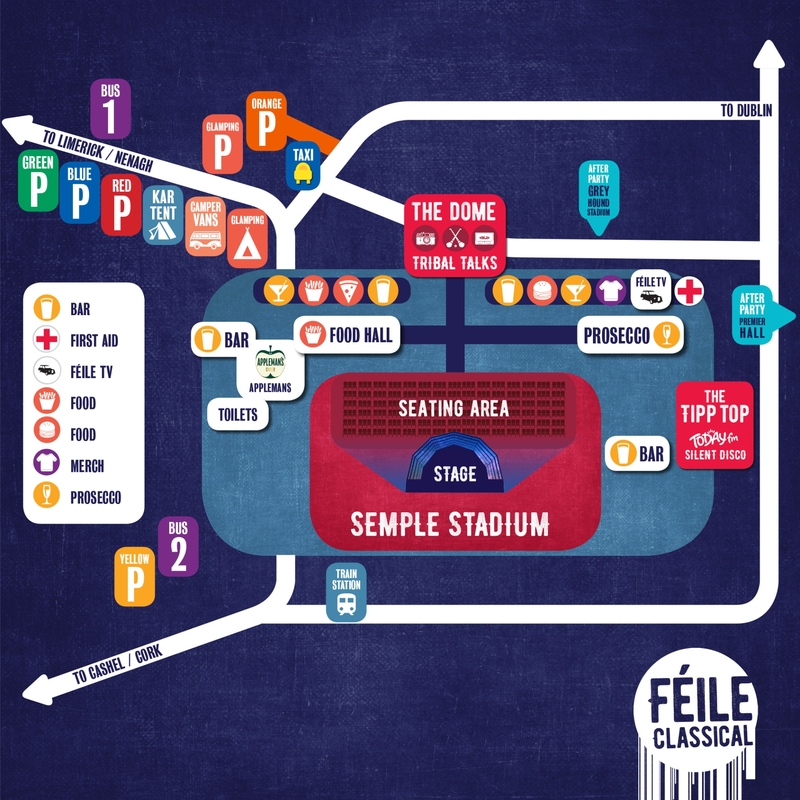 Feile Classical ticket holders have access to all daytime entertainment plus the late night silent disco and The Dome at Semple Stadium. The after-parties at the Premier Hall and the Greyhound Stadium are separate events with tickets from Ticketmaster or on the door on the night. There are a number of same-day return bus routes departing from Carlow, Kilkenny, Cork, Fermoy, Dublin, Portlaoise, Galway, Ennis, Limerick, Nenagh, Waterford, Clonmel, Athlone, Birr, Roscrea and Tralee. Return journeys will depart 45 minutes after the end of the concert from the drop-off point at Thurles Racecourse. Tickets cost from €20 – €35 and are available now for Friday here and on Saturday here. Semple Stadium is a 13 minute walk from Thurles train station via Bohernanave however there are no special trains running for Feile Classical. There will also be a number of car parks close to the concert venue opening at noon and closing at 3am which cost €10 per day. Tesco Ireland in Liberty Square will also run a free Shuttle Bus from our Thurles store to Semple Stadium on Friday and Saturday - on the hour from 2 - 7pm. First come first served. Just pick up your free ticket from the Customer Service Desk. In a far cry from the Feile days of the 1990's, festival goers can now 'glamp it up in style' in the designated Feile campsite in luxury Tipis, yurts or even a KarTent made from 100 percent strong, recyclable cardboard. Local accommodation providers in the town were booked out within minutes of Feile tickets going on sale earlier this year. - Barbecue or external cooking equipment including gas cookers. What is allowed inside Semple Stadium?